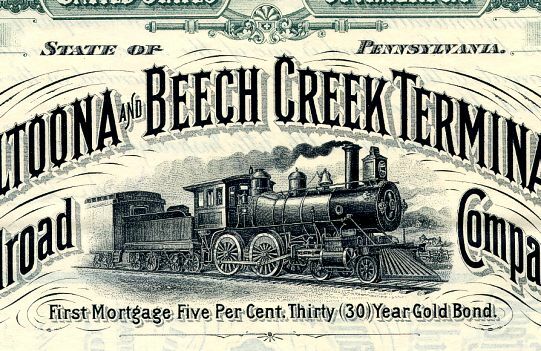 Beautiful certificate from the Altoona and Beech Creek Terminal Railroad Company incorporated in 1897. 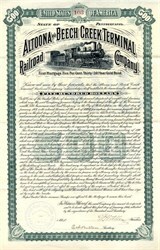 This historic document has an ornate border around it with a vignette of a steam locomotive. This item has the signatures of the Company's President, W. W. Allen and Secretary, E. G. Walters and is over 118 years old. Signed by Frank G. Patterson on back as guarantor. The Altoona and Beech Creek Railroad was a narrow gauge railroad in Blair and Cambria Counties, Pennsylvania which operated during the late 19th and early 20th century. It carried passenger traffic up from Altoona to Wopsononock and coal and timber down from Wopsononock and Dougherty to Altoona. The railroad was chartered on May 27, 1890 as the Altoona and Wopsononock Railroad. The president was Frank G. Patterson, an Altoona attorney. Originating at Juniata, a northern suburb of Altoona, the 3-foot (910 mm) gauge line followed Spring Run up into Juniata Gap, climbing up the face of the Alleghenies on a long, tightly curved line to reach Wopsononock. The railroad was opened in May 1891. Patterson had invested extensively in the coal lands around Dougherty, 5 miles (8.0 km) beyond Wopsononock. He wished to extend the line to Dougherty, and a further 12 miles (19 km) to Coalport on Clearfield Creek. To finance the extension, the shareholders, in November 1891, authorized a $60,000 mortgage on the property, and allowed Patterson to issue himself 600 additional shares of stock. On January 22, 1892, the railroad's name was changed to the Altoona, Clearfield and Northern Railroad to reflect the projected extension, which was built that year as far as Dougherty. However, a struggle for control of the railroad now ensued. Patterson had agreed to sell 60% of the company's stock to James Kerr, who was expected in turn to sell the stock to the Pennsylvania Railroad, at whose Juniata station the line terminated. However, before Patterson could transfer the stock to Kerr, the directors of the railroad sold a majority interest in the railroad to Samuel P. Langdon. Langdon controlled the Altoona and Philipsburg Connecting Railroad, a short line in the Philipsburg area whose southern end would reach Ramey, about 17 miles (27 km) from Dougherty, in 1894. He intended to connect the two railroads and use the AC&N to enter Altoona. Patterson and Langdon both claimed to control a majority of the company's stock, and in February 1893, rival boards of directors were elected by stockholders loyal to those two figures. The issue of 600 shares to Patterson, authorized in 1891, turned the issue, and its validity was ultimately upheld by the Pennsylvania Supreme Court and Patterson's board of directors ordered seated. Langdon promptly petitioned for a receivership, and was appointed joint receiver with Patterson. This was briefly lifted, but the railroad failed to cover its operating expenses shortly thereafter, and Patterson was re-appointed receiver on September 28, 1896. On February 26, 1897, it was sold under foreclosure to William L. Shellenberger, who had been vice-president under Patterson and was also connected with his coal companies. Langdon continued to try to exert control over the railroad. He leased it to the Pittsburg, Johnstown, Ebensburg and Eastern Railroad, a holding company formed to operate the Altoona & Philipsburg Connecting, planning to convert to standard gauge and extend the two railroads to a junction at East Frugality. On December 17, 1898, he chartered the Altoona and Beech Creek Terminal Railroad, which was to extend the line from Juniata to a new terminal at 9th Street and 15th Avenue in Altoona. However, he was unable to carry out these plans, and his lease was invalidated and his officials ejected from the railroad in April 1900, returning it to Shellenberger's control. Despite the battle waged for possession of it, the railroad had not been very profitable. Passenger traffic to Wopsononock had been declining, and coal traffic from Dougherty was rather limited. A major forest fire destroyed both the Wopsononock Hotel and the coal tipple at Dougherty on April 30, 1903. Insolvent again, it was once more sold under foreclosure on April 30, 1910 to H.A. Davis, and reorganized as the Altoona, Juniata and Northern Railroad. Davis, in turn, sold the line to Sigmund Morris, of Altoona. Morris had incorporated the Altoona Northern Railroad on November 7, 1912 to acquire the line, and the Altoona, Juniata and Northern was merged into it on January 16, 1913. Morris planned to convert the phone to standard gauge, electrify it to make it an interurban, and extend it to connect with the New York Central at Patton. While he did complete the conversion in February 1916, neither of the other two plans were carried out, and the company was in receivership again in 1918. The railroad shut down permanently on July 30, 1919 and tracks were removed in 1921.